(CNN) -- The wait is over for Pope Benedict XVI's many Twitter followers, and they have been quick to respond to the much anticipated first tweet from his personal account Wednesday morning. Using the handle @Pontifex -- meaning "bridge builder" in Latin -- he posted: "Dear friends, I am pleased to get in touch with you through Twitter. Thank you for your generous response. I bless all of you from my heart." A flood of tweets expressing joy, admiration, antagonism and skepticism followed from the Twitterverse, not to mention a fair few jokes. "Wow! Is this true?! Pope Benedict XVI has started tweeting! Welcome Your Holliness! I'm grateful for your blessing! Follow him!" tweeted @Joyful_Minoz. "Our Pope Benedict XVI has a twitter account! Coolest Pope in history!" wrote @alexaSaclao. "@pontifex welcome on twitter. Glad you are now reachable to openly discuss gay marriage, birth control and gender equality!" said ‏@wimremes. Some are more skeptical about the pontiff's personal involvement. "For the first time in history, a man can communicate directly with some low-level press officer in Vatican," tweeted @EsaMakinen. 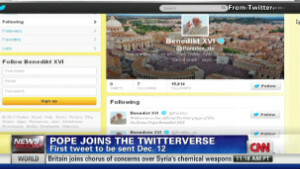 A Vatican official told CNN last week that the pope would compose the tweets for the new account himself. But while the pontiff pressed the button to send his very first tweet, others are expected to send future tweets on his behalf. The pope followed up his first message with two more tweets within minutes. "How can we celebrate the Year of Faith better in our daily lives?" asked one. The answer: "By speaking with Jesus in prayer, listening to what he tells you in the Gospel and looking for him in those in need." This prompted comment that the pontiff had missed the point about social media being interactive. "@Pontifex is answering his own tweets now. That's not really how it works, Your Holiness," said ‏@exitthelemming. The pope's venture into social media has also sparked a flurry of jokes. Comedy writer Colm Tobin tweeted: "RT @Pontifex Thou shalt not covet your neighbour's Twitter followers." "I hear he's changing it to 'thou shall not covet thy neighbour's wifi,' " was another tweeter's humorous take. An hour after his first tweet, the pope had around 700,000 followers on his English-language account. He is also tweeting in seven other languages, including Spanish, Portuguese and Arabic. This prompted admiration from some fellow tweeters. "Brilliant that @Pontifex tweets in 8 languages simultaneously incl. Arabic ... : Truly pioneering," said @gsurya. "Not even I could manage 8 Twitter accounts. I suppose @Pontifex has God on his side," remarked @BizPaul. However, not everyone was impressed. "So disappointed that @Pontifex did not write his first tweet in Latin," said @laiabalcells. The secretary of the Pontifical Council for Social Communications, Monsignor Paul Tighe, told Vatican Radio that the sending of the first tweet was "an extraordinary moment." The attention it sparked within the "Twitterverse" was quite impressive, he said, with more than 2,000 retweets in under two minutes. Vatican officials said last week that anyone could send in a question to the pope's personal account via the hashtag #askpontifex or #B16. Pope Benedict has some previous experience at tweeting, having launched the official Vatican news site on Twitter, @news_va_en, in June of last year. Other religious leaders have found great success with Twitter. The 140-character limit for tweets allows for short messages, perfect for small verses of scripture or inspiration. The Dalai Lama (@DalaiLama), Rick Warren (@RickWarren), Joel Osteen (@JoelOsteen) and scores of other religious leaders spread their messages via the site. A commentary written by Vatican spokesman the Rev. Federico Lombardi for Vatican Radio last week said: "140 characters -- the number contained in a tweet -- are quite a few. Most of the verses of the Gospel have less; the beatitudes are much shorter. A little concision isn't bad." He added that while short messages on Twitter could not carry the whole teachings of the Catholic Church, they would help spread the word to those who wanted to hear. "Of course the world will not be saved by tweets but among a billion baptised Catholics and among the seven billion people of the world; several million people will be able to feel the Pope is closer in this way too, hearing him say a word for them, a spark of wisdom to bear in their minds and hearts and to share with their twitter friends," he wrote. "A new service of the Gospel." While Benedict is the first Catholic pope to take to Twitter, he isn't the first twitterized pope. That honor goes to His Holiness Pope Tawadros II, the 118th pope of the Coptic Church of Egypt. But Pope Tawadros has around 6,300 Twitter followers; Benedict had tens of thousands on his first day out. John Paul II, who preceded Benedict, was the first pontiff to use the Internet, and the 20th century saw a string of other milestones for popes using technology to reach the masses. Pope Pius XI made the first papal radio broadcast in 1931. His successor, Pope Pius XII, made the first papal television appearance in 1946. CNN's Marilia Brocchetto, Eric Marrapodi and Ben Wedeman contributed to this report.